There are a lot of issues with Yelp’s unforgiving 5-star rating system: to start, a difference of 0.02 stars could potentially mean boom or bust for a restaurant. When ratings were graphed against a restaurant’s 7pm dinner availabilities, it was clear that the 3.26 restaurant would receive a lot more business than the 3.24. At the end of the day, Yelp users will see either a 3-star or 3.5-star rated restaurant and data has shown that users invariably are drawn to higher rated restaurants. Considering that millions of livelihoods are tied to the successes and failures of our beloved restaurants, a difference of 0.02 stars plays a larger role in our lives than it should. How can Yelp amend this? Yelp could further gamify their review environment by awarding an “(Insert Cuisine Here) Expert” badge to reviewers that are well eaten in a particular type of cuisine. For Yelp, that is as easy as tracking the types of restaurants a reviewer checks into, and awarding expert badges after, for example, 15 check-ins at sushi restaurants. The reviewer could get a cute little icon by their name on reviews they write for which they are an expert in the cuisine. A quick mockup of an expert icon added to a Yelper’s review. Let’s get anecdotal for a second here. I mean, to be fair, a Thai restaurant shouldn’t have offered cream cheese puffs in the first place. But in Yelp’s review system, that user’s opinion matters as much as someone who may have grown up in a Thai household, and can discern the ingredients of a curry blindfolded while reciting the alphabet backwards. I mean, something’s not right there. That would be like the state of Nebraska getting as many electoral college votes as California. 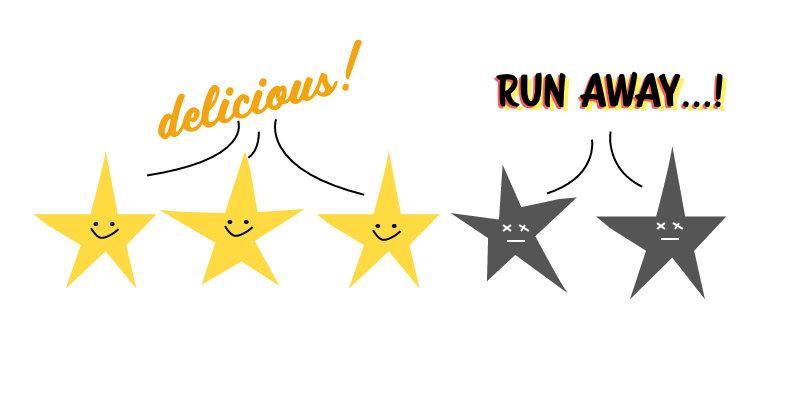 Yelp should weigh expert reviews more than the average reviewer. And if they built the badging system I mentioned earlier, this is a natural extension to it. Let’s say an expert bestows a 4-star review — that review could count as 40 out of 50 stars — which would weigh their opinion as 10 times more important than the average user. It’s not a perfect system, but we’re getting somewhere. Allow Users to Make Informed Decisions ! Ultimately, Yelp ought to make sure that its users are able to make the correct food decisions based on the most accurate information available. Phoodieur is one of the upstarts in the review industry here in the States which empowers user decisions. In addition to emphasizing photo quality, the review system is based on a sliding scale — allowing for much more granularity than 5-stars. Openrice is an Asia-based food review service which allows users to rate restaurants across a variety of metrics: taste, decor, service, hygiene, and value. This paints a much fuller picture of a restaurant and allows users to make a more informed decision. There are a lot of opportunities for Yelp to create an ecosystem empower users to make informed decisions, and I hope that they take note.